In 2005, the Lord renewed his call to Don and Elizabeth Kantel to serve in Africa under the banner of Iris Ministries. No strangers to Iris, they visited annually following their first trip in 1999. In 2002, they served long-term at Zimpeto, where they directed Hospitality and ministered to hundreds of visitors. The Kantels come to Iris from Summerside, PEI. However, they lived in St. Stephen, NB for 30 years, where Don was founding president of St. Stephen's University, a Christian university. Don holds degrees in political science and theology and recently completed a D.Min. in leadership and renewal studies at Regent University in Virginia. Elizabeth, who has an M.A. in organizational leadership, has been actively involved for many years in community-based health care—in particular, home-based volunteer hospice programs and services related to senior and geriatric care. 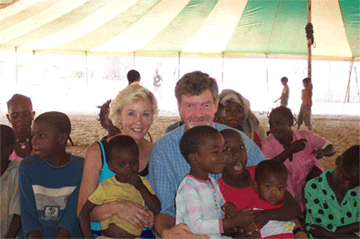 In October 2005 the Kantels joined Heidi and Rolland and their international missionary team based in Pemba. With whole villages coming to the Lord in northern Mozambique, they will also be pursuing a vision to lead transformational and sustainable community development, as part of the holistic gospel Iris is presenting to poverty-stricken communities. They believe the Jeremiah 29:11 promise of “hope and a future” applies to Africa too! And their vision is to mobilize resources and develop community servant-leadership to help bring lasting transformation to some of earth's poorest people…to the praise of God's glory! Don and Elizabeth are sent out with the blessing of their church families, their son and daughter-in-law, Tim and Sarah, and their young grandsons, Evan and Jonah. Email Don or Email Elizabeth or view the Kantels website at www.harvestinafrica.com/harvestinafrica.com.